“Who let the dogs out?” Well, you can, too, with these Hot Dog Machines! Whether you choose to grill them, steam them or roll them, there is a perfect machine for you. 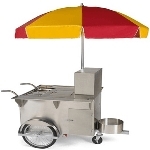 We have you covered from a dog pound hot dog steamer to a dog house hot dog roller and even an old fashioned mini hot dog cart. Choose the style that best fits in your business. Serve up delicious, perfectly cooked hot dogs from an electric grill and customers will buy, buy and buy. 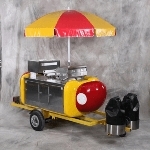 A hot dog machine is perfectly suited for getting high sales and profits. Customers can’t resist the tempting concession food from hot dog stands. Get an increase in impulse buys because shoppers succumb to the delicious tantalizing links on a hot dog grills and hot dog steamers. Use a commercial hot dog machine to offer appetizing hot food all day. These steamers and grills are ideal for hot dogs, sausages, and breakfast links. Place and serve those fresh-cooked hot dogs with our hot dog starter kit and stainless steel tongs. Don't forget to the attractive and easy to use hot dog bags. 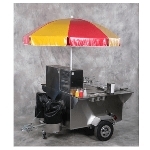 Whether you have a restaurant, snack bar, or concession stand these hot dog machines and hot dog supplies will bring you higher returns on investments. 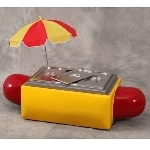 Get your dogs barking and purchase your hot dog concession equipment today!